Clémence Isaure is a semi-legendary medieval character, who is credited with the foundation or restoration of Jeux Floraux of Toulouse. The legend says that Clémence Isaure born in 1464 in Toulouse, was determined by a vow to her mother as nun, but loved by Raoul, the natural son of the Count of Toulouse, who lived in a neighboring home. Soon the lovers agreed; but the mother’s vow mindful to Isaure allowed no conversation; only flowers placed in the column of the Wall, indicated their feelings. Raoul fell soon afterwards in the Battle of Guinegate, Isaure became a nun, but renewed in memory of her love the Jeux floraux and dedicated her assets to this foundation. The ode which she wrote on the occasion of the first prize distribution, she acquired the name of Sappho of Toulouse. 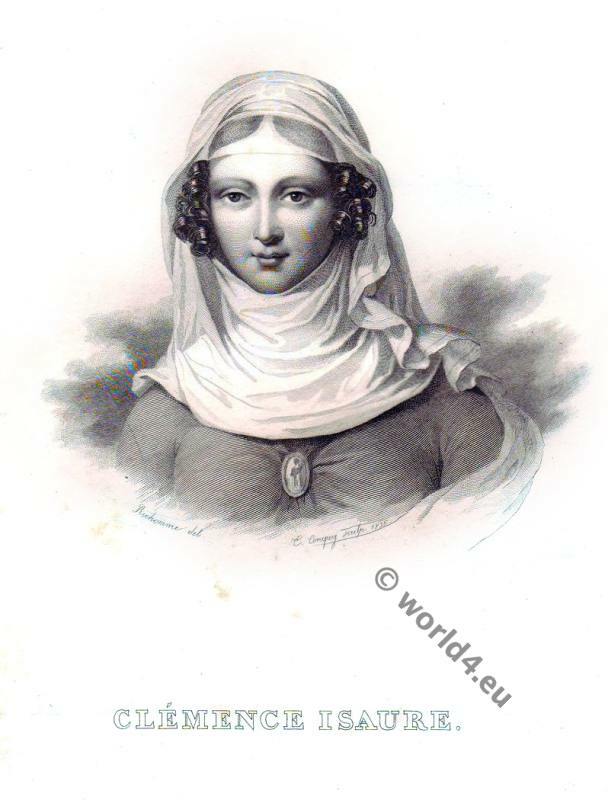 This entry was posted in 15th Century, France, Middle Ages and tagged Medieval costume, Portrait on 1/10/15 by world4.